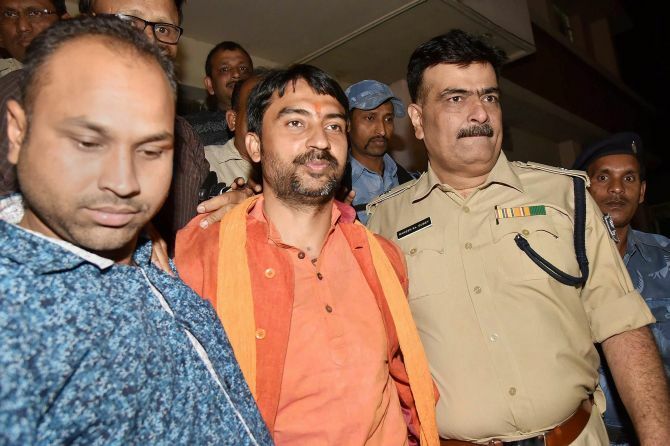 Union minister Ashwini Kumar Choubey's son Arijit Shashwat was arrested in Patna on Sunday over his alleged involvement in recent communal clashes in Bhagalpur, and remanded to 14-day judicial custody, the police said. The arrest came barely a few hours after a Bhagalpur court rejected the anticipatory bail plea of Shashwat against whom an arrest warrant was issued on March 24. "We had information that Shashwat was at the famous Hanuman temple in the vicinity of Patna junction. A police team reached the spot and arrested him and he has been sent to Bhagalpur", Senior Superintendent of Police, Patna, Manu Maharaj told PTI. The police produced Shashwat at the residence of Additional Chief Judicial Magistrate A R Upadhyay, who sent him to 14 days judicial custody, public prosecutor Satya Narayan Prasad Sah said. Shashwat is the son of Union Minister of State for Health and Family Welfare Ashwini Kumar Choubey. On his arrest, Shashwat told reporters, "I have given myself up to police in deference to the court order. I have been wrongly accused of evading arrest." "I was not absconding as I have not committed any crime. If raising slogans in praise of 'Bharat Mata' and 'Sri Ram' is a crime then I may be called a criminal," he said. Shashwat has been named, besides eight others, in one of the two first information reports lodged at Nathnagar police station of Bhagalpur following communal riots that broke out on March 17 after some people objected to playing of loud music during a procession led by him. It had been taken out allegedly without permission to celebrate the New Year as per the Hindu calendar. Several persons, including two police personnel, were injured in the clashes that witnessed heavy stone-pelting, arson and exchange of fire. The alleged delay in Shashwat's arrest had invited strong criticism from opposition parties in Bihar, especially the Rashtriya Janata Dal-Congress combine, which accused the Nitish Kumar government of soft-peddling the matter while Choubey had dubbed the FIR against his son as a 'piece of garbage'. Reacting to Shashwat's arrest, ruling Janata Dal-United spokesman Neeraj Kumar said it was a fitting reply to the Opposition while Congress leader Prem Chand Mishra said the whole episode showed the 'helplessness' of Nitish Kumar before the BJP. Why are Bihar's Muslims frightened?